I was cleaning up my computer at work today of some of the photos I have been accumulating. Typically the photos at work are from work or project related photo shoots, but sometimes the family ones get on there as well. I came across this set of photos of Robyn that I thought I would share. She is such a cutie, but a tough one to capture lately. She is always rushing the camera to try and see herself on the LCD screen before I can even take a shot. Jeremy has been teaching me how to download all the pictures from my camera, fix red-eye etc and then upload them to the blog. So lots of pictures from now on! I rely so heavily on Jeremy for all my technological needs/wants that I usually don't bother to learn them myself. 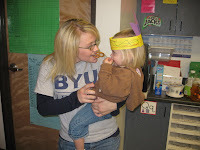 Allison had her Thanksgiving Feast on Tuesday at school. Robyn got to come along for the ride and Allison had fun taking Robyn out to recess while I helped set up. I really believe that Robyn thinks that she is 5 an d supposed to be in kindergarten! 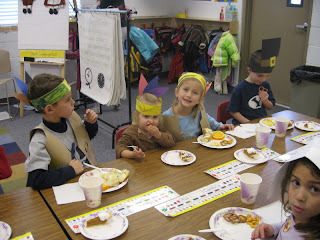 Allison and her class had been busy making Indian and Pilgrim hats, and Indian vests and learning Thanksgiving songs. After they ate they played Indian games. Robyn is definitely the baby of the family because she has no fear of strangers but took turns playing with all the aides. We have to do so many volunteer hours for Allison's school. We had a meeting with one of the board Tuesday night about making a video highlighting the teachers at Lincoln. I was excited to have a project that will give us the hours I need and that Jeremy can help do - what am I saying help? - I mean I will help Jeremy do it. Monday night Spencer's football team had a FHE/service project activity. The coach's wife talked about strengthening our spiritual muscles and then we helped assemble bags of supplies for children at the homeless shelter. Then they passed out goodies. Robyn thought it would be a good idea to take a bit out of each cookie she could grab - luckily we caught her as she went for the third. Kids only had school on Monday and Tuesday and then were out for the week. They have all enjoyed the time off of school. Wednesday we spent the day cooking and kids spent the day playing. If Allison doesn't have a friend over to play with, she thinks its the end of the world right now. Luckily she has a sister who wants to play with her most of the time. Robyn is getting opinionated and sometimes Allison thinks its fun to tease her which ends with a lot of screeching. Thursday we had a great relaxing Thanksgiving. I went to the gym in the morning, which always feels great. I usually do the after kids are in bed routine which is always hard to drag my body to. I think everyone else had the same idea of burning off some pie in advance, a s the place was packed. Spencer was pretty bummed out about not having much family around this year - we have been spoiled in previous years. 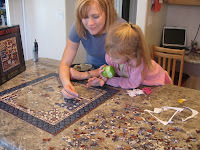 We worked on a puzzle most of the day. I called it the one day puzzle when we started saying I got a hard one that would take a whole day to do. We're now calling it the four day puzzle but the end is in sight now. Lauri came over to spend most of the day. We put up the rest of our Christmas lights. Tomorrow night is our block's lighting parade so we were starting to feel the pressure to get them up! Jeremy banged his kne e a little on the roof so he stayed home with the boys to soak in some football and the girls and I did a hike up in the hills. We went up to the same waterfall we have done in previous years. Its an easy, short hike and had a good rewarding view at the end. 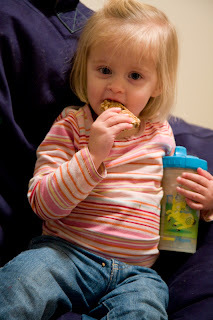 We ate tons and discovered Allison's new favorite pie - chocolate pecan. Its just pecan pie with chocolate bits stirred in before cooking. Robyn very quickly learned the word pie. That evening we watched Elf. Robyn was so into the movie at the end we were just busting up watching her try to cheer on Santa's sleigh - crouched over going "go go, up" then "wee" everytime it went into the air and then back to "go go" everytime it crashed. There is a scene where Will Ferrel tackles a tree as he attempts to put a star on the top and it crashes over on top of him. Spencer inherited some of the same hysterical laughter that besets me and Daniel at times as he was just giddy with laughter over that scene and laughs still whenever he talks about it. Friday I did something I always swore I would never do. I got up at 5 and went and camped out at a video game store that opened at 7 in an attempt to get a wii. It was 20 degrees outside!!!! Luckily I got there in time, as I was number 26 and they had 30 in stock. So I was excited about it and came home to sit in the hottest bath I could stand to get the chills out. Friday afternoon Meredith watched Taylor and Robyn and I took Allison and Spencer and two of their friends to a trampoline plac e called Jump on it. What mayhem! They had a great time and when done were happy with red, sweaty faces. 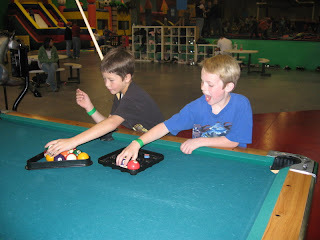 They had a pool table there that Spencer and his friend made a sad but enjoyable attempt at playing pool. Friday and Saturday we put up our Christmas decorations. I have a pile of broken ornaments to fix here on the counter next to me. Spencer broke the stand on our tree so there is a definite list to it but its held together with some heavy twine. Luckily after Allison broke of the head of our wise man and Spencer broke the tree we had Robyn for some light relief. Jeremy made up for not watching much football so far this year, yesterday as he cheered on BYU and all the other college rivalries. Spencer thought it was so cool that Max Hall, the quarterback for BYU wears jersey number 15 just like him - so he wore his football jersey to show his support. Allison gave a talk in Primary today. I was teaching so I wasn't able to be there but Jeremy said she did a great job. She colored pictures to go along with her story. Jeremy, good guy that he is, recorded her talk on his phone for me to hear. We are hoping Taylor's new wheelchair gets here soon. You have to push in on his stomach to get the buckle to fasten right now. I am sure it isn't very comfortable. He has filled out a lot this last year and although he he is skinny size wise he doesn't look like it as he has a layer of fat/muscle all over now. Spencer has had a much better week since he started the fish oil. Not to say that things are great but when he is having a bad time now it stands out more because it isn't all the time. The biggest sign to me that things are better than they were is that he has started playing with friends again periodically. Our neighbor asked him to watch his gold fish this week for him while he was in Arizona. I am amazed that fish is still alive! I cleaned the bowl once to get all the extra food out of there and once went to buy a replacement even when I found it floating belly up. But like Lazerus it came back to life and is still swimming around. Spencer has been busy working on a representation of the Washington Memorial for class. Doesn't want us to see it yet but I know it involves a lot of aluminum foil and cardboard. Robyn has learned to ask for 'dino' now a song she loves to dance to. If Jeremy is home she is no longer content to dance by herself but wants Jeremy to dance with her. He gets quite the workout some evenings. I got my hair cut yesterday and streaked. They put some red in which always looks really strong the first couple of days. Spencer wanted to know if I did that on purpose. I admit it was looking really red yesterday but has calmed down a lot after washing my hair. I went to get some groceries for Lauri afterwards. I had a great brainwave while doing so - we're going to look into a local delivery service. Its the weekly need for bread, eggs and milk that gets hard to keep up with. Hello world, I do exist on this blog. 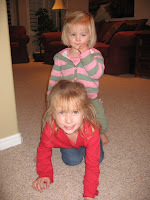 I figured since Heather has decided she likes using this blog format I might as well get started participating as well. The old site is still up, but the format is getting dated and some of the features here are pretty nice, so looks like we will be setting up shop over here. I hope to archive the old site in a way that everyone can have it, but not sure quite yet how I will do that. Life has been pretty busy it seems, not just of late, but pretty much the whole year. That's how we keep me out of trouble though. This last weekend I enjoyed a short trip to photograph another Donny event, which I actually expect to be my last, at least for a long time. Things are winding down on that front and I am getting more and more out of the loop. In fact this last trip was more to help my friend with a project I passed over to him rather than tackle myself. I have been taking a fair amount of video lately along with a bit of sports photography during the football season. I am lucky enough to get sideline passes to the Ute games through my friend who's older brother is the head coach. I may be a BYU grad, but who can turn down sideline passes to any game?! My photos get little use, but the athletic department uses them for web postings and possible in future programs and such. I did have the opportunity to take photos at the 4A Football State Championship as I was hired by some parents to capture their kids in action. It was a fun event and one I would like to do more of in the future. With all the video I have been taking of the family, I realized I haven't posted anything online; that is one reason I wanted to go over to this blog format because they already had the tools to embed video better than the old site. With that in mind, here are a couple of videos of Robyn, our resident video ham. We have quickly discovered that Robyn is just like the other kids, spoiled by the instant gratification of the digital world. These kids haven't known anything but that. They all want to see themselves on the camera LCD the moment a picture is taken. Kinda funny, but it makes taking a quality video of her quite hard! Robyn is infatuated with Allison's hamster Crystal. The only problem is that Robyn knows how to get Crystals cage open (very easily as the video shows) but is not too great about making sure Crystal gets back in before she loses interest. Right after I stopped this video Cyrstal showed me how she can easily jump off the counter to get to the floor. That must be a drop 30x her height onto hard floor, but she shook it off and proceeded to escape. Not much else to say other than love you all and hope you have a happy Thanksgiving. Jeremy has been in Las Vegas this weekend taking photos of his concerts and helping his friend wrap up their video project. He had someone ask him to film their son's football game Friday morning in return for which they bought him a ticket to Las Vegas so he could still make it to Friday's concert in time. His friend with a car lot needed to have a car driven back so he his driving home this afternoon. Without him around to take half the conversations/attention needs of kids today, Sunday has been a little intense. Luckily Spencer and Allison both had the great idea of making welcome home signs so there is a momentary quiet. Friday night I was very self indulgent and spent the evening after kids were in bed drinking hot chocolate and reading a book start to finish - haven't done that in a long time. My cold hit me full force Monday which was pretty miserable but has gotten better every day since. I had a moment of revelation though, Monday night. I drew myself a hot bath, after giving kids all baths, and running what had to be the 10th load of laundry that day (all the kids had to have their beds washed on the same day I do my massive load of laundry each week!). As I stepped into my barely luke warm bath I decided we needed to get an extra water heater or train my kids to shower in the morning if I ever wanted a hot bath early in the evening again. Last Sunday Jeremy's family came over for dinner. Jason brought over his Wii for us to try it out - we have been trying to get one for Christmas but no luck yet. Boys loved playing all the games - Allison was the best at bowling and Spencer fell in love with the virtual boxing. We took Lauri over this week to get her cast made for her daffo for her weak foot. Now that kid's schedules are varied, every trip usually involves me taking her somewhere, running back to get kids from schools and then picking her up again. Since she doesn't drive anymore we usually try to hit a grocery store on the way home for her. Kids are usually pretty understanding about the long time waiting in the car - especially as Lauri bought them doughnuts this time. Spencer started back into cub scouts this week. He was a bit agitated about going but got himself all spruced up to go and was waiting for Jeremy to walk him down. But then he saw a friend cracking a joke inviting him to go with him, and you could see the tension leave his body and he left with a smile. We started giving him fish oil this week. To get to an effective dose, you have to get 1000mg of EPA - which means 5 HUGE capsules a day. He swallows them OK now but its a lengthy process. An hour each night of us grinding our teeth and trying to keep ourselves from shoving them down his throat. As a good sign Spencer is starting to have friends call again, and his next door friend and he played together twice this week. School says he is still doing better. At home most of the time though it seems as bad as it ever was - rages, mad outbursts for no reason, paranoia - but no deep depression. We are going to try upping his seroquel this week for the last time. They did say lithium takes longer to see an effect but if we don't see improvement by the 7th we are going to be switching drugs around. I had hoped that with time the bed wetting side effect would go away, but no such luck. The bad part is that Spencer now accepts it as normal. He is starting to get a rash in uncomfortable spots so I am hoping that will help motivate him to get it under control. Things aren't all bad though - he is getting homework done on his own again. Doing jobs to get privileges etc. Tomorrow before school he gets his retainer put back on - they are trying to make it an extra close fit so he can't wiggle it with his tongue again and break it. Our electrician has been working all week on the basement. Jeremy still has to run the Cat 5 and install all the cans. Tomorrow they are working to sledge hammer an electrical outlet out to be under Jeremy's desk. For family home evening we put up the easy portion of our Christmas lights. We bought 2 little penguins this year that light up for the front of our house. 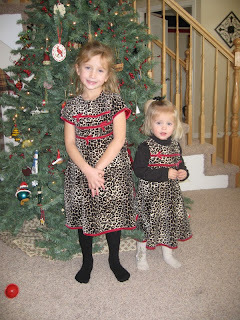 The girls thought they were really cute. With the block lighting parade next week, Jeremy will be under pressure when he gets back to get all these projects done! I have been working on a lot of projects this week for Allison's school. I have to have 40 hours of volunteer time in by March and am starting to get panicky. I only have 10 so f'ar. Allison is busy working to get ready for her dance recital in January. All the girls are wearing red shirts and jeans and dancing to "Rocking round the Christmas tree". Emotions seem to be close to the surface with her lately but the tears quickly go away. We ran to a uniform sale on Friday and bought her some new pants. She and Spencer both seem to have grown or pants have shrunk in the last month. Taylor has his perpetual runny nose but has been enjoying the fall weather this week with the sun shining and highs reaching mid-60s. We have a rice bag we heat up for him at night and put by his feet, he just cuddles right in with a smile. Robyn is still an opinionated, mostly happy, always wanting junk food little girl. Her vocabulary is just taking off and I sometimes have to look to see if its Allison or Robyn saying "mom, phone" She gets carted around a lot but is happy destroying a coloring book in the back seat of the car usually. Last night I had a solo date since Meredith was here. I went to the temple and by chance got put in a deaf session. It was interesting to see the ceremony with sub-titles and a person signing. Afterwards I ran a few errands to pick up some last Christmas gifts and must have been blessed for going to the temple as everything I was looking for was on sale and easy to find! My friend and I had a great idea this year for neighbor presents. We bought a bunch of $1 glass plates from walmart and some ceramic markers from Michaels. We're drawing on the plates cookies for Santa and a christmas tree and then cooking them for 40 min to make the markers permanent. Then plop some cookies on and you're done. I thought it was a neat idea. One of my other friends had done it for birthday presents one year writing FHE treats on the plate along with cartoon figures of each person's family. We're getting together after Thanksgiving. Am stuck with the sniffles right now - must be that time of the year. At least its so cold outside right now that hot tea and a warm blanket sounds really good. We are going to try switching to a blog following the trend of David and Daniel's families. Yesterday I went on my annual girl's day out with my friends. We have a great time going to lunch, visiting craft stores and buying all our Christmas presents. I look forward to it for months. A cheesecake factory just opened up in SLC which we tried to hit for dinner but it was a 4 hour wait. Since we didn't get there till 8 p.m. we decided that was more than we cared to do. But I was able to get a piece of cheesecake to go. Very good. Guess I'll need to run a lot more this week! I made fruitcake this week. The responses were pretty funny - Spencer "yum, when can I have some" Allison: "are you going to make something yummy for me to eat instead of that stuff" Jeremy: "now, why are you making this?" Robyn "please, me, me" - give her a bit and then its "yuck, spit, spit". So I am starting to feel the holidays are coming. The weather started turning the weekend from the brisk fall days that I love to the cold, sleet in the air, winter is around the corner weather. I planted rye grass seed in the vegetable gardens to see if helps the soil. Read that it was a good idea, I will see how it works in the spring. I am having a hard time convincing Spencer and Allison that short and sandal weather is over. We had the framers finish this week on the basement. Our electrician and Jeremy are going to start pulling wiring tomorrow. Its neat to see it start taking shape. The framers worked at night and the sound carried through the vents through the whole house. Spencer met his new psychiatrist this week. Had to get his blood drawn which for him was a big deal. He is as high as he can go on lithium and they are going to go as high as they can on seroquil. They understand why we don't want him in the hospital again but said that he is very unstable in their opinion still. We want to max out his current meds though first before we switch to anything else. The deep depression is gone but he still has very strong paranoias and fears. They didn't want to add anxiety medication when he still has so many up and downs as they are afraid they will send him into constant rages. Some days are better than others and sometimes you can tell he knows he is acting strange. He does try half the time to really control his behavior to get our approval which is sad in a way to watch as its often a real struggle for him. School though is going well as he is able to not freak out with other kids or with his teacher. This week we going to try adding fish oil supplements which sometimes help. On Tuesday Spencer had his big end of the year football dinner. Jeremy spent many nights and almost all day Monday working on a movie for the dinner. He had interviewed the coaches and interspersed their talking about the experience and about each kid with music and clips from the games. He went through to find a clip of each kid playing the play the coaches were talking about. It was a lot of work but it turned out really well and the kids were all excited to see themselves playing. Jeremy set up his screen and borrowed a projector to make it all work. Spencer had to really screw up the courage to go up and get his trophy but he did - had to go hide in the truck afterwards for a while but he is very proud of his trophy. Allison is getting ready for her Christmas dance recital. They are dancing to rocking around the christmas tree. 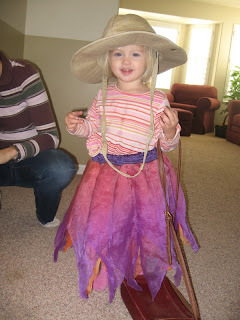 She is busy every day finding friends to make crafts with and run around. Emotions seem to run high a lot of the times - either trying to annoy Spencer and crying when he is mean to her or upset over not getting something she wanted. Thought a lot about how I need to make some changes in how I parent this week. Am trying to do better in how I ask for kids to do things and to keep a looser schedule. Seems that everything runs smoother when I do - or at least it seems that way to me because I don't stress out so much about it. Allison went and got her library card this week. She was very excited to check out her own books. Allison's school requires each parent to volunteer 40 hours a year. So we are busy trying to come up with volunteer hours. I have a bunch of Indian vests I am cutting out of grocery bags and I got to go into Allison's class twice this week. 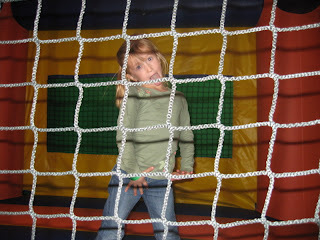 She really loves her school and has a great time with all her little friends there. She can sound out most short words now and loves to point out things she can read. 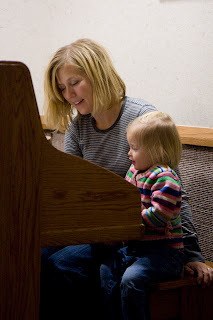 It was the Primary program today and Allison did a great job with her part. She was proud that she didn't have to read it, as it was memorized. Robyn has become a cute pill of a kid. She thinks every food should be candy and she should eat all the time. So we're working on that. 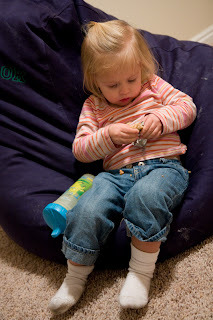 She tries to throw these mini-tantrums which we try hard not to laugh at. Hopefully she will figure out soon that they don't do any good. She wants so badly to be like Allison and follows her and her friends around whenever possible. Allison likes it most of the times. 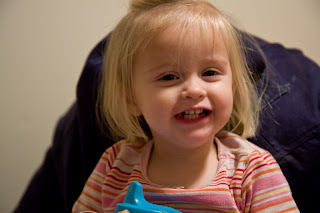 At night we hear this little voice saying "allison..." They just think its funny when we tell them to be quiet. Taylor has the same cold I do. Hmm...wonder where I got sick? So besides a constant snot face, he is doing good. I am looking to move him next year to Lincoln as well. Its either that or Linden's junior high. I need to go in to look at both programs. It seems that day to day life is pretty busy lately. I taught today which accounted for most of my free time this week. I do enjoy teaching although I still get pretty nervous every time. But people are really good at sharing comments and many have actually read the lesson which surprises me at time. Hope you are enjoying the Thanksgiving season!